But we have Titan automatic, Sir!" said the somewhat bemused saleswoman as I thanked her, turned around and exited, defeated, from the sixth or seventh watch store that morning. “Thank you, Miss," I said, “but I really have to buy an HMT watch." A month or so ago, I was suddenly taken with the idea of buying an Indian automatic watch. I don’t remember how this inexplicable need suddenly hit me. Maybe I walked past a billboard in an airport for one of Titan’s gorgeous Tandem skeleton automatic watches. I am not exactly sure what planted that seed of desire, but it was planted deep and firm. But in the process of googling Titans, I began to run into these forum posts on newish HMT automatics. And they looked amazing in the way that Fabindia clothes look amazing: somewhat flawed, not entirely well-finished, but utterly desirable. What was most seductive about these watches was the fact that the movements were automatics entirely made at HMT factories in India. Not Chinese, not mass-produced Swiss, but authentic Indian movements. Now, I must admit that I had no idea HMT made automatics. I knew that the beleaguered company still made watches. But automatics? Who knew. The more I read about the watches, the more I got hooked. Thanks to some obsessive HMT collectors on the Watchuseek.com forums, I learnt that HMT has two somewhat new automatic ranges: the NASL and the ADSL. And the moment I saw the NASL-03 model with the white dial and brown leather strap, I knew I was hooked. It was love at first sight. Inside the watch is a movement based on the 8205 automatic calibre made by Citizen’s Miyota division in Japan. The watch is a simple three-hand model with a day and date at the 3’o clock position. For added “desi value", the watch displays the day in Hindi and English. Priced at around ₹ 4,000, with a genuine leather strap, luminous hands and at least three days’ power reserve on a full winding, the watch seemed excellent value for money (add another zero if you want the exact same configuration from a half-decent Swiss brand). But how to buy it? First, I called all the HMT phone numbers I could find on the Internet. Not a single one worked. Then, I called up all the stockists I could find in half-a-dozen online yellow page services. Not one of them stocked HMTs any more. Then, I decided to hit the road. An entire circuit of Connaught Place later I all but gave up. The most humiliating experience was walking into a store stocked high with Breguets and Rolexes and sheepishly asking if they had any HMT NASL-03s. Back home, I decided to give it one last shot: eBay India. Roop Agarwal, who later told me his main business is a textile exporting outfit in Lucknow, runs KVSuperstore, an online storefront on eBay India. Agarwal’s store stocks 24 different models of HMT watches. The cheapest is the ₹ 650 HMT Prabal, and the most expensive deal is ₹ 4,990 for a set of five gorgeous HMT Pilot watches (a splendid, funky gift idea). Just two days after placing an order, I received a carefully packed NASL-03 timepiece with white face and brown strap in a delightfully retro dark blue HMT box made of faux leather. (the watch comes with a one-year warranty). Sensing my urgency, Agarwal even threw in express shipping from Lucknow for free, even though I’d only paid for regular courier. Agarwal told me that he first began shipping HMT watches to textile buyers abroad who also wanted to sell Indian watches as novelties. Over time local demand had increased too, he said, and this is why he had begun selling them on eBay. The watch does have its quirks. The polished steel bezel has a few minute scratches, and the strap needed a touch of superglue to patch up a loose end. But those are minor quibbles. I absolutely love my watch. So the next time you’re in the market for a good watch or a clever gift, why not give Roop Agarwal’s KVSuperstore a look? 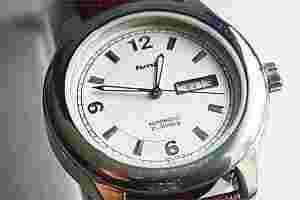 His HMT watches are cheap, have a certain retro chic about them and, most of all, are bloody good watches.